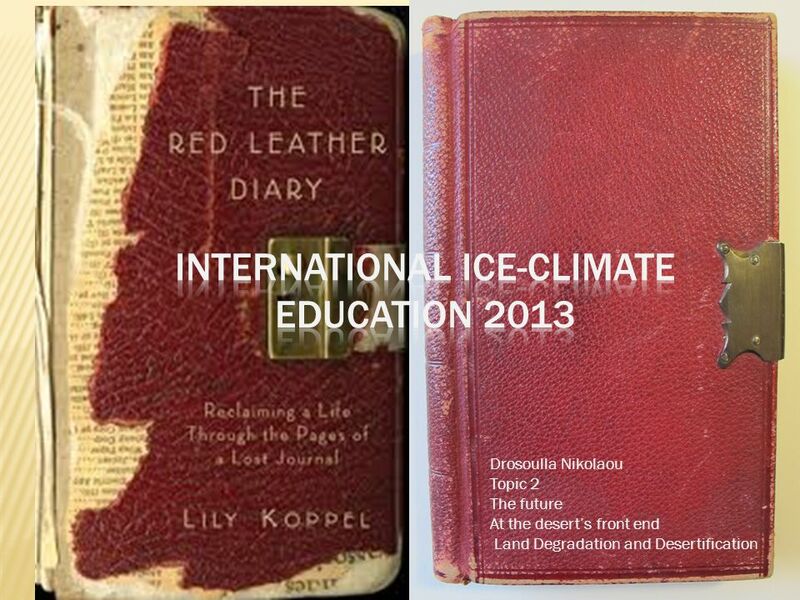 Drosoulla Nikolaou Topic 2 The future At the desert’s front end Land Degradation and Desertification. 2  Many years ago, in 2007, predictions were made about climate and weather changes in our home planet. Most of those predictions unfortunately have become true. Extreme weather events like droughts, heat waves, heavy rainfalls, increased intensity of cyclones and increased temperatures have inevitably led to LAND DEGRADATION, DESERTIFICATION and SOIL EROSION. People were forced to migrate and leave their villages as the fertile land was becoming barren and the deserts moved towards their civilizations thus increasing land degradation, making life in those areas unsustainable. However, UN- officials, who have always cared about both their home planet and the people all over it, have been trying to find answers to these huge environmental disasters and even ways to prevent future ones. Better land management, better farming equipment, improved water management technologies, drought resistant seeds were some of the actions suggested by Gnacadja. 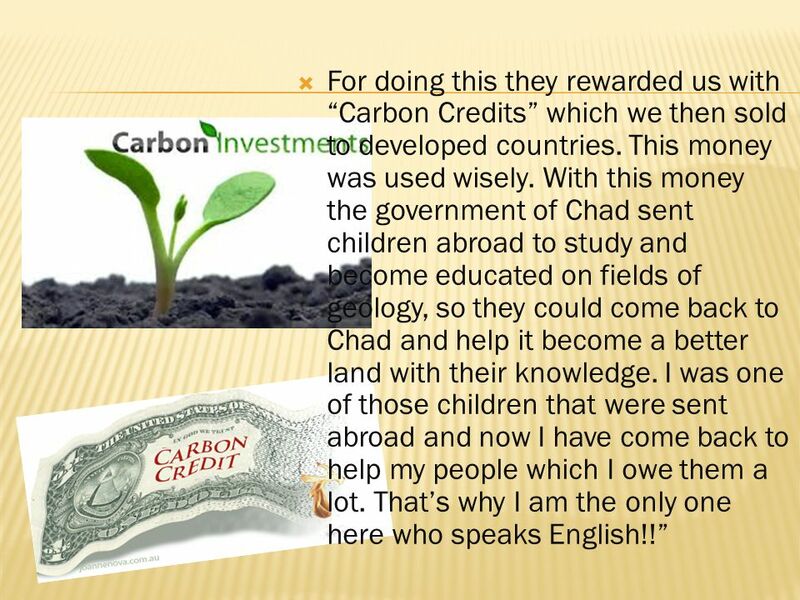 3  For doing this the farmers would gain “Carbon Credits” which could then trade for money. Through the years more and more farmers adopted these methods thus protecting their land from further land degradation and desertification. Even more hope was given to people living in these areas as environmental activists encouraged farmers, by offering them money, not to cut trees entirely so that the tree roots would remain and grow back up. 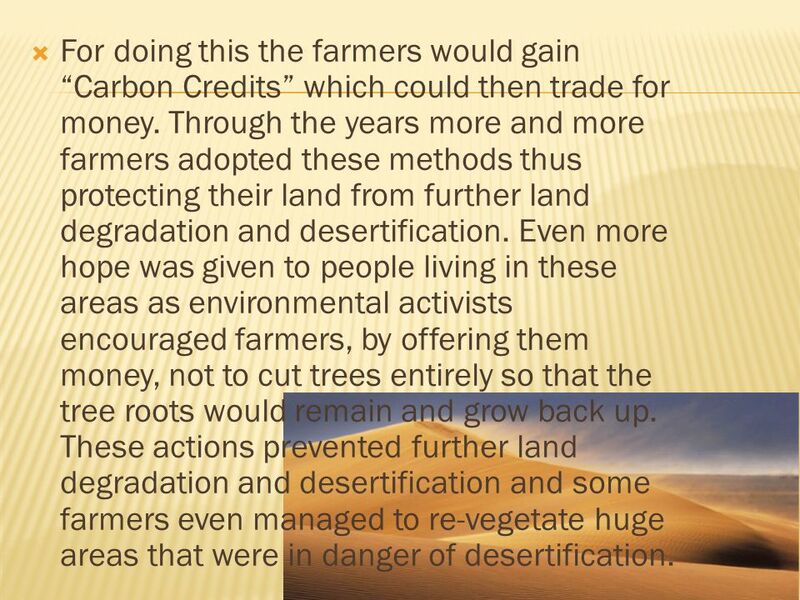 These actions prevented further land degradation and desertification and some farmers even managed to re-vegetate huge areas that were in danger of desertification. 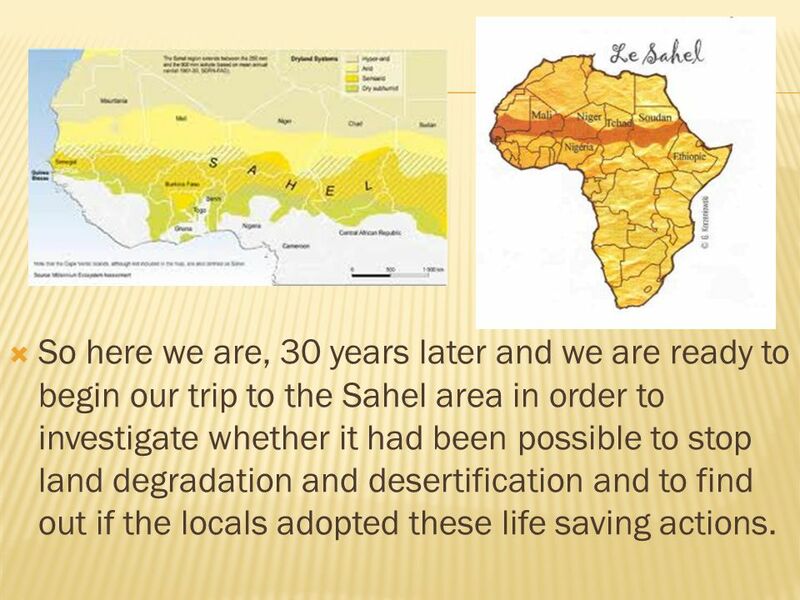 4  So here we are, 30 years later and we are ready to begin our trip to the Sahel area in order to investigate whether it had been possible to stop land degradation and desertification and to find out if the locals adopted these life saving actions. 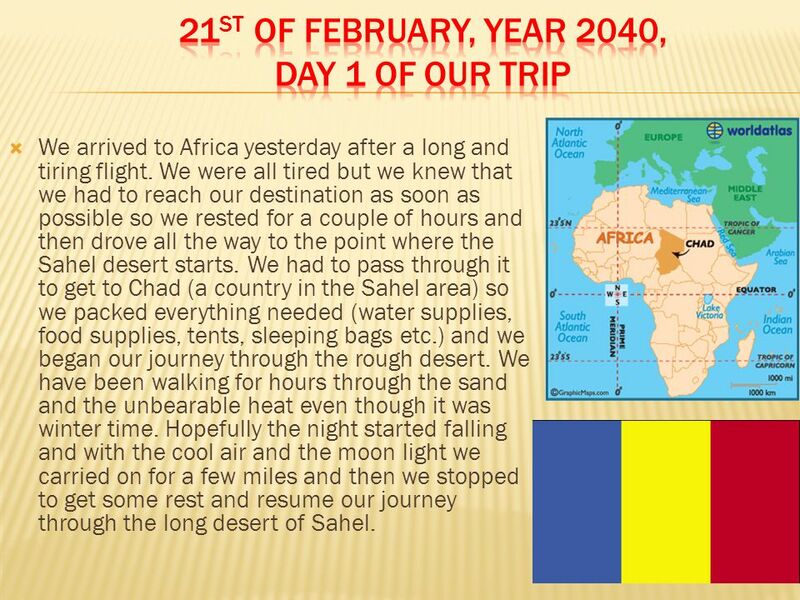 5  We arrived to Africa yesterday after a long and tiring flight. We were all tired but we knew that we had to reach our destination as soon as possible so we rested for a couple of hours and then drove all the way to the point where the Sahel desert starts. 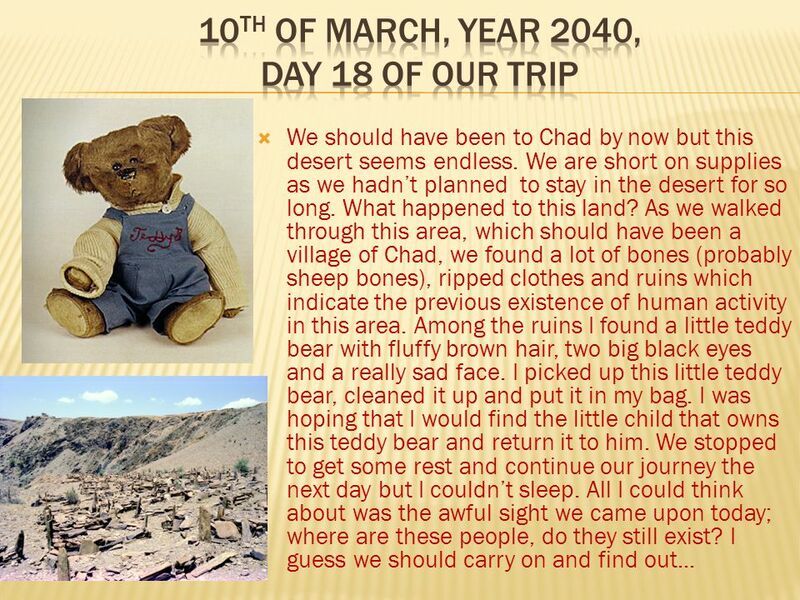 We had to pass through it to get to Chad (a country in the Sahel area) so we packed everything needed (water supplies, food supplies, tents, sleeping bags etc.) and we began our journey through the rough desert. We have been walking for hours through the sand and the unbearable heat even though it was winter time. Hopefully the night started falling and with the cool air and the moon light we carried on for a few miles and then we stopped to get some rest and resume our journey through the long desert of Sahel. 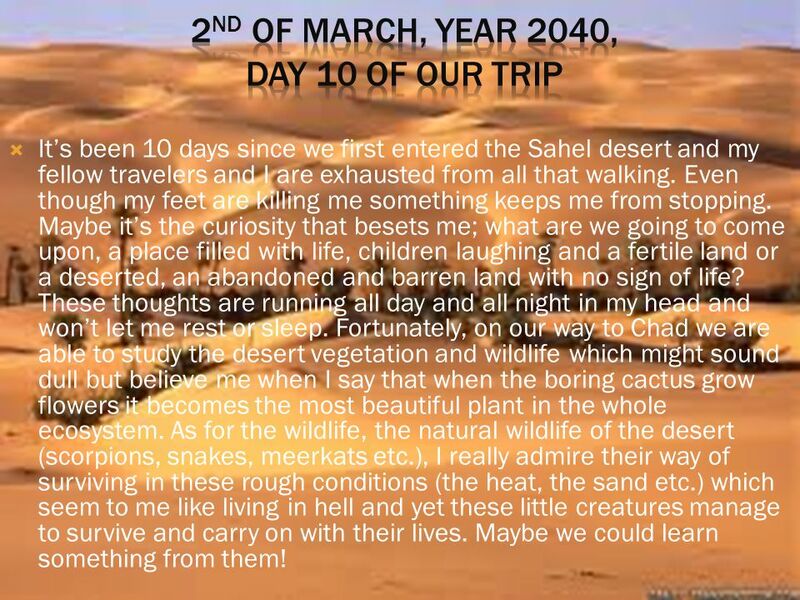 6  It’s been 10 days since we first entered the Sahel desert and my fellow travelers and I are exhausted from all that walking. Even though my feet are killing me something keeps me from stopping. Maybe it’s the curiosity that besets me; what are we going to come upon, a place filled with life, children laughing and a fertile land or a deserted, an abandoned and barren land with no sign of life? These thoughts are running all day and all night in my head and won’t let me rest or sleep. Fortunately, on our way to Chad we are able to study the desert vegetation and wildlife which might sound dull but believe me when I say that when the boring cactus grow flowers it becomes the most beautiful plant in the whole ecosystem. 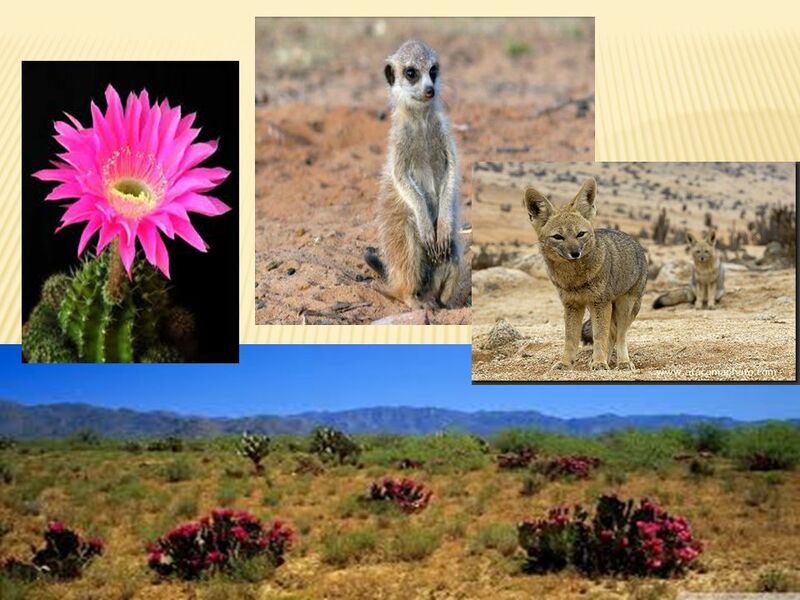 As for the wildlife, the natural wildlife of the desert (scorpions, snakes, meerkats etc. ), I really admire their way of surviving in these rough conditions (the heat, the sand etc.) which seem to me like living in hell and yet these little creatures manage to survive and carry on with their lives. Maybe we could learn something from them! 9  Another week has passed and we haven’t found a sign of life or human activity so far. Our supplies were almost over and the whole group was more than exhausted. We were ready to give up and report back to the UN officials these horrible news; necrosis of the landscape, desertification, land degradation of Chad. As we were ready to go back we heard someone shouting: “Hey there, are you looking for Chad? It’s this way!” We turned around and saw a man standing on a hill of sand and we all headed to his way. We were both happy and relieved as we knew that our days in the desert were over at least for now. 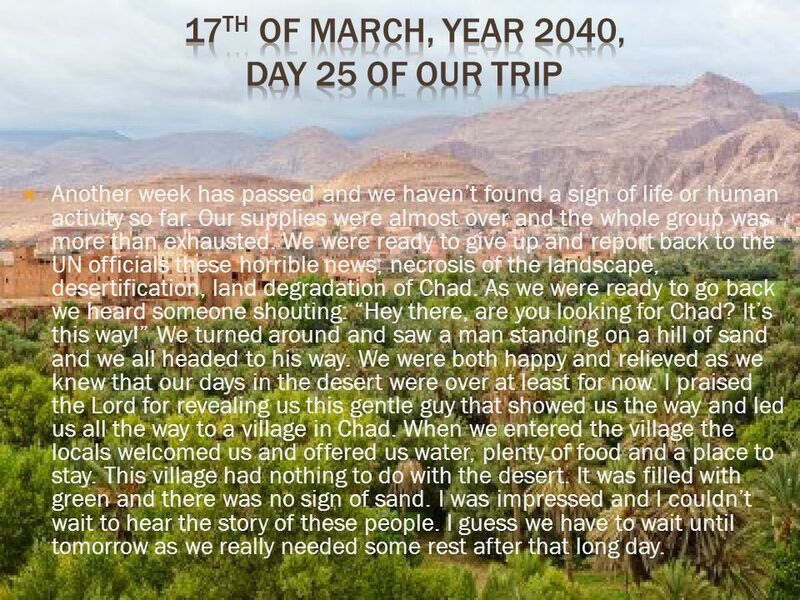 I praised the Lord for revealing us this gentle guy that showed us the way and led us all the way to a village in Chad. When we entered the village the locals welcomed us and offered us water, plenty of food and a place to stay. This village had nothing to do with the desert. It was filled with green and there was no sign of sand. I was impressed and I couldn’t wait to hear the story of these people. I guess we have to wait until tomorrow as we really needed some rest after that long day. 10  What a nice sleep that was! I haven’t slept like that since we began this trip. I feel really refreshed and I was ready to hear how these people got here and managed to maintain this land fertile and out of the desert. The man who saw us in the desert and led us here, his name was Chibuzo, offered to show us the village. He started by showing us the land where the villagers grow the bare essentials to satisfy their hunger (vegetables and fruits) and we watched them as they planted with love and tenderness the seeds that would grow into trees. Not far from these cultivated fields, you could see the green valley on which the local shepherds kept their animals (sheep, cows, pigs etc.). After that we went back to the village where we had the chance to see under what circumstances these people live. 11  Simple houses with few amenities or comforts, just the essential; bathroom, bedrooms and a small living room. 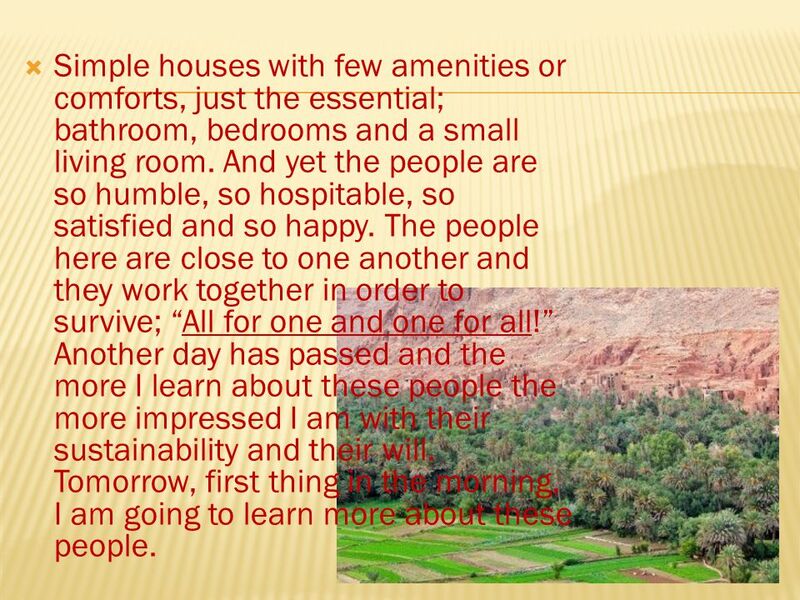 And yet the people are so humble, so hospitable, so satisfied and so happy. The people here are close to one another and they work together in order to survive; “All for one and one for all!” Another day has passed and the more I learn about these people the more impressed I am with their sustainability and their will. Tomorrow, first thing in the morning, I am going to learn more about these people. 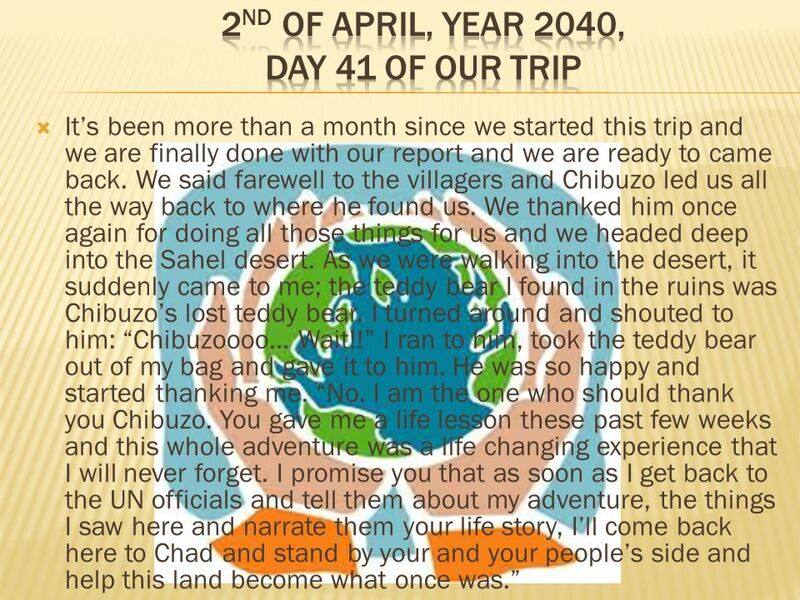 12  I woke up today and I couldn’t wait to go outside and meet that kind man that helped us reach our destination, Chibuzo, and ask him to tell me his story. I asked the locals where I can find him but no one seemed to speak English. Finally I found him in his house studying and I immediately started asking him questions. “How come you are the only one here that speaks English?” was my first question. He was still reading his book and when he finished reading he closed the book turned to me and said: “My people have been through a lot these past few decades. My ancestors saw their land becoming dry and they lived and worked in the desert’s front end. The temperature was rising day after day and the land was becoming barren and weak. 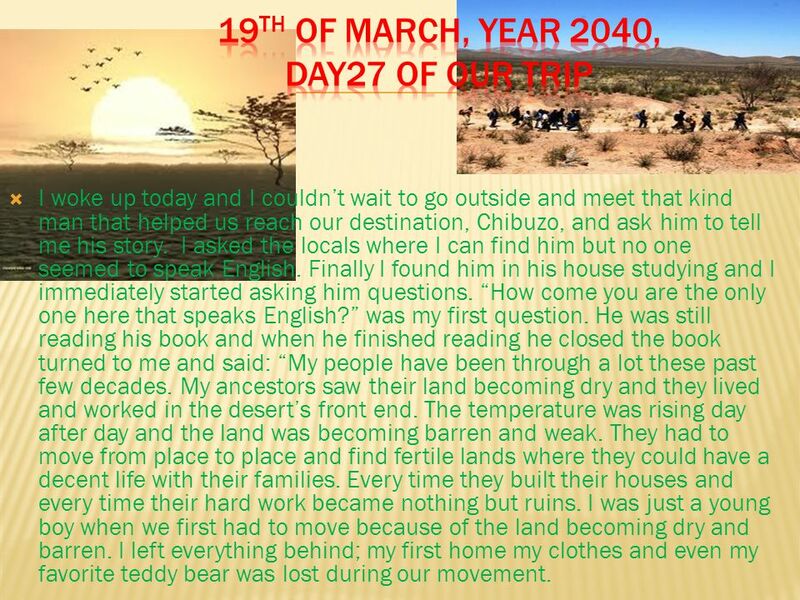 They had to move from place to place and find fertile lands where they could have a decent life with their families. Every time they built their houses and every time their hard work became nothing but ruins. I was just a young boy when we first had to move because of the land becoming dry and barren. I left everything behind; my first home my clothes and even my favorite teddy bear was lost during our movement. 13  This immigration of ours caused troubles between my people as the land was too little for us thus ending up in local wars between the immigrants (who lost their land and were in search of new a one) and the inhabitants (whose land was becoming overpopulated and couldn’t handle such pressure). As if this wasn’t enough, the frequent heat waves, the intense cyclones and other weather conditions drained our hopes for better days. We were desperate and completely hopeless. However, the UN officials, that saw what had happened to us, gave us ideas on how to improve our land management (introduced us to better farming equipment, water management technologies, drought resistant seeds etc.) and things started to change. 15  As he was telling me these, a tear came out of his eye but dried right away. With his story he managed to answer all my questions even those that I didn’t get the chance to tell him. 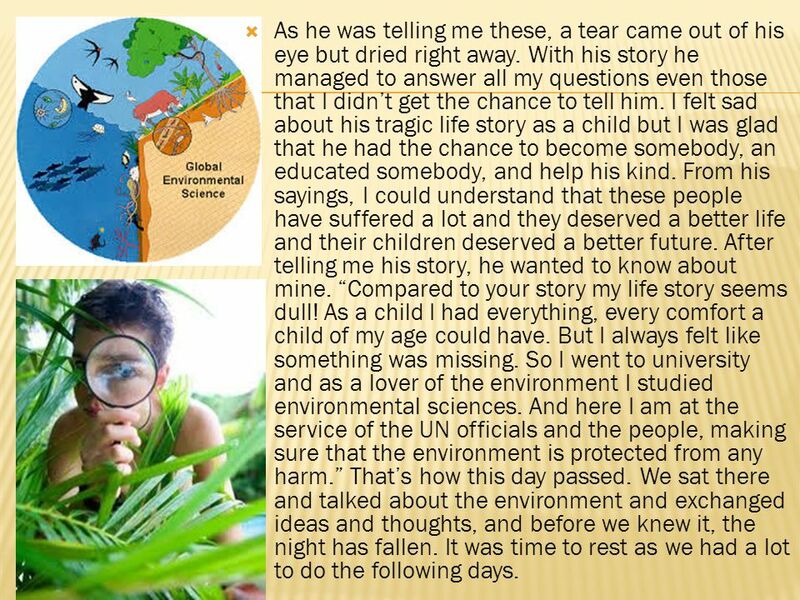 I felt sad about his tragic life story as a child but I was glad that he had the chance to become somebody, an educated somebody, and help his kind. From his sayings, I could understand that these people have suffered a lot and they deserved a better life and their children deserved a better future. After telling me his story, he wanted to know about mine. “Compared to your story my life story seems dull! As a child I had everything, every comfort a child of my age could have. But I always felt like something was missing. So I went to university and as a lover of the environment I studied environmental sciences. And here I am at the service of the UN officials and the people, making sure that the environment is protected from any harm.” That’s how this day passed. We sat there and talked about the environment and exchanged ideas and thoughts, and before we knew it, the night has fallen. It was time to rest as we had a lot to do the following days. 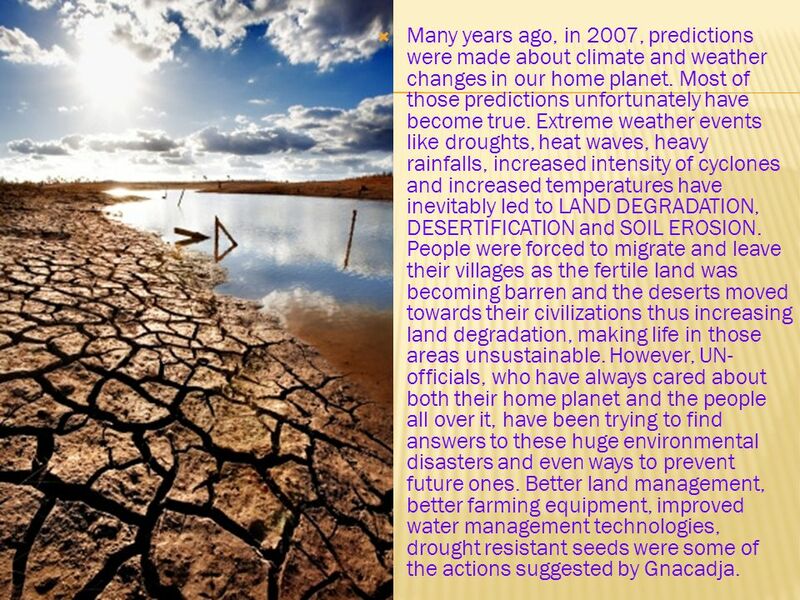 Download ppt "Drosoulla Nikolaou Topic 2 The future At the desert’s front end Land Degradation and Desertification." OUR DIARY By Dilan and Myriam. Let's start the trip ! Thursday, October 30th,8 pm, we've just arrived in Istanbul, wow ! What a huge city ! Looks like. 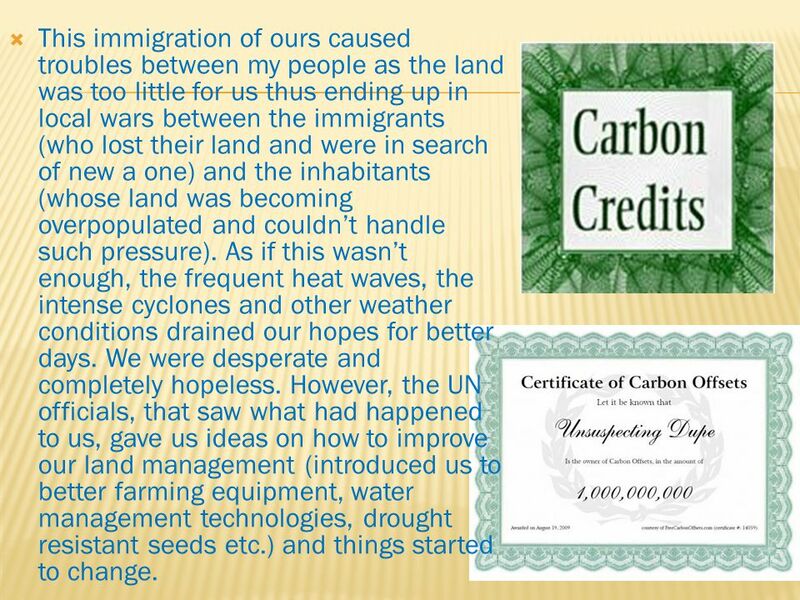  I am doing this power point about the time before the white people came.  The reason I am doing this is that this history is interesting to me because.